7.10 Why should you pat meat dry before you cook it? https://icook.tw/recipes/52101. 照燒醬汁 does not need a lot (don't need to be proportional to the recipes). It took 15-20 minutes to cook chicken wings/drums. USDA Prime (最好, 牛排) 一隻牛只有 1~2.5% 的肉被判斷 prime. 未經農業部檢驗牛肉 called No-Roll Beef. 商人推出新詞匯 like Butcher's prime, Top choice select. 新鮮牛肉不會黏手, 壓下後立刻恢復. Chuck (牛肩) and Round (後腿) 運動量大 肉較韌 適合燉煮. Short Loin (里肌), Tenderloin (小里肌) 適合燒烤 (roast). Sirloin 位於牛的背部 (煎牛排). Top sirloin (靠背部) is even better than bottom sirloin (靠腹部). Note that beef brisket/shank 牛腩 are suitable for 燜、慢煮和烚，絕不適宜做牛扒(排). The is a low-fat, well muscled part of the animal so these cuts are not known for their natural tenderness. These cuts work best when cooked with moist heat, such as braising, stewing, or pot roasting. Need to thawed the (closed) package in some room temperature water for 15 minutes. Oven w/ 400F degrees. Bake 7-10 minutes on each side using a broiler pan or grid. Oven w/ 350F. Put in a glass container (too small in my case). Bake 25 + 20 minutes. Sear beef 2-3 minutes on medium high heat each side. Cut in pieces first. Defrost: 4 hr * pounds. For example 16 pounds needs 4 days. Remove giblets (wrapper) under the neck location and the neck inside. Season with salt, butter, herbs, garlic. Roast: 325F for 4 hours for a 16-pounds turkey. See the included instruction in the turkey. If the bird is brined, the time is shorter. I bought one (brined already) from Samsclub, it is 12 pounds and the cook time is 3 hours (true especially I brined it again overnight). The included popper goes up and the temperature is over 165 °F. Wait for 30 minutes before enjoying. Discard celery, onion and gizzard. Chop liver and neck meat and return to pan. Add chicken broth or if you have a turkey, use drippings (about 1 1/2 cups and 1 can of chicken broth). Chop eggs and add to broth. Mix cornstarch and milk together and slowly add to broth. Stir well until thickened. Reduce heat to low. Bring the turkey stock to a boil in a large saucepan. Stir in soup, and season with poultry seasoning, pepper, seasoned salt, and garlic powder. Reduce heat to low, and let simmer. Warm the milk in the microwave, and whisk in the flour with a fork until there are no lumps. Return the gravy to a boil, and gradually stir in the milk mixture. Continue to cook, stirring constantly, for 1 minute, or until thickened. 三文魚/鮭魚 鱒魚 Salmon. Omega 3 & Vitamin D.
Preheat the oven to between 350°F and 450°F. The bigger the fish, the higher the temperature. Rub the fish, inside and out, with olive oil and sprinkle with salt and pepper. Stuff the fish, if desired. (Small fish like sardines are better served with a external sprinkling of, say, chopped garlic and parsley rather than a stuffing.) A variety of things work: very thin citrus slices, fennel, whole herb sprigs, sliced olives, sliced garlic, caramelized onions, sliced tomatoes, etc. Place the fish on a roasting pan lined with parchment paper or olive-oil rubbed sliced vegetables (fennel and onions work best) and rub the outside with a little more olive oil. Give it another sprinkling of salt and pepper. A typical 1-2 pound single serving fish like trout or branzino (European bass) might take 20-30 minutes at 400°F. Midway through, pour a bit of white wine into the pan. Fill a large bowl with hot water and submerge the frozen ahi tuna steak while it's still wrapped in airtight packaging. Leave it for about 10 minutes to thaw. Unwrap the tuna steak and pat it dry with paper towels while the pan heats. Brush both sides with a little cooking oil, then sprinkle on salt and pepper to taste. Pat on other flavoring agents, if you like, such as thyme, dill, tarragon, rosemary, lemon or lime zest or a touch of chili pepper powder or Cajun seasonings. Place the ahi tuna in the pan (no need to worry it will stick to pans; it's OK to use stainless steel pans) and sear it for 2 to 3 minutes for rare to medium-rare. Turn it over with a spatula or tongs. Cook the other side for another 2 to 3 minutes for rare to medium-rare. Turn the tuna steak again and cook both sides once more for another 1 to 2 minutes each for medium or medium-well. Remove it from the pan promptly. The U.S. Food and Drug Administration recommends limiting your consumption of tuna to less than 12 ounces a week and even less if you are pregnant or nursing. See Is Ahi Tuna Good for You? Nutrition facts based on 4 oz servings. Typical frozen packs from Trader Joe’s come with four 4 oz servings (total is about 1 pound and $8/pound). Labels on the packaging side 1 and side 2.
https://www.simplyrecipes.com/recipes/dads_fish_stew/. Onion, garlic cloves, parsley, chopped tomato, clam juice, 1 1/2 lb fish fillets (halibut, cod, red snapper, or sea bass), dry oregano & thyme, Tabasco sauce. Kirkland: 400F 10-12 minutes. 13% sodium. Sams club: 375F 16-20 minutes. 3% sodium. What does "color added" mean on a label for salmon at the grocery store? 2 teaspoons of kosher salt. Ground black pepper. Leftovers can be stored in an airtight container in the refrigerator for up to 4 days. It is better to cut AGAINST the grain. 到底小蘇打 (Baking Soda) 跟泡打粉 (Baking Powder)有甚麼不同? What are the differences between corn starch and baking powder? Baking powder is a leavening agent, made from sodium bicarbonate, corn starch, and a few weak acids. The purpose of using it is to make your baked goods rise or keep your baked goods from being flat and overtly dense when done baking. Corn starch - its primary use is as a thickening agent, much like xanthan gum, and not for making baked goods rise. Baking powder is “a powder used as a leavening agent in making baked goods"
Baking powder typically consists of sodium bicarbonate (baking soda), an acidic substance…and starch or flour. Without an acid combined with the baking soda, you’re left with what some would describe as an “alkaline-y” flavor. Nonstick and stainless-steel skillets (must-have): 10 inch. Opt for a stainless-steel one to brown meats, crisps up skin-on chicken pieces, and saute vegetables. Deep-sided skillet (must-have): 12 inch. Great for shallow frying, braising and finishing a pasta dish. The high sides prevent oil splatter as you're frying. Cast-iron skillet (must-have): 10 inch. To remove stuck-on food, add kosher salt to a still-warm pan, then rub with a kitchen towel. Discard salt, rinse with hot water, and heat over medium-low until dry. http://www.dodocook.com/recipe/65685 糯米粉 2杯, 牛奶 1.8杯, 砂糖 0.3杯, 融化有鹽奶油 1大匙, 黑芝麻粉 1杯, 糖粉 0.5杯. 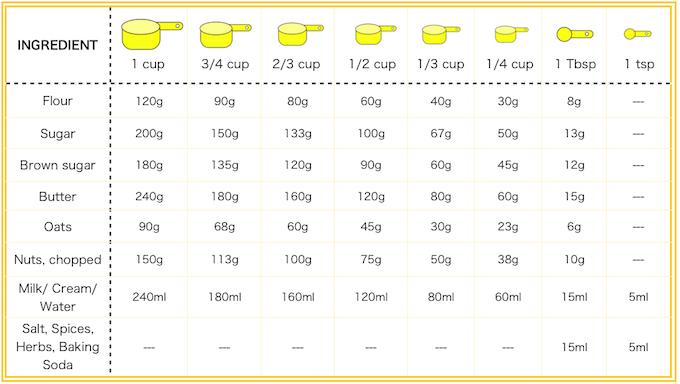 Note that 1 cup is about 150 grams picture. 1 cup is about 240 cc. How to keep it from browning? https://food52.com/blog/11020-how-to-keep-an-avocado-from-browning Pictures are included for 3 methods. Many discussions. For a 2000-calorie diet, the daily intake of fat, including MUFAs (What are MUFAs, and should I include them in my diet? ), is capped at 65 grams. A five-ounce, medium-size avocado (roughly one cup) contains 23 grams of fat — that's almost one third of your fat intake for a day — and roughly 250 calories. Replacing the cheese on your turkey sandwich with avocado. Half an avocado would be sort of the max per day. It’s important not to think of avocado as a fruit or vegetable: It’s a fat. Avocados are mostly monounsaturated fat. As a general rule of thumb, I’d stick with eating one to two servings, which is anywhere from 2-5 slices, of avocado about 2-4 times per week at most. See How Much Avocado Should You Eat Daily? Daily limit: 200~300 milligrams (mg) of caffeine or about two to three cups of brewed coffee. Best time: when cortisol is low (9-11am, 1-5pm). The effect of caffeine is 20 minutes after drinking. So it is effective to drink coffee and take a 20 minutes nap. 2 tbsp of 'ground' coffee is about 14 grams? (verify it by a real scale). Example: tall hot Latte with sugar-free cinnamon syrup, tall hot Cappuccino with soy milk, a black coffee with no sugar. Everything you want to know about Chia!. See #13, Upon getting it wet, it generates a soluble fiber in the form of mucilage, or the gel formed around the seed. This gel allows chia seeds to be digested and pass through the body more easily. Once it reaches the stomach and makes contact with the gastric acids, chia begins to break down and nutrients begin to be used by the body. Fresh Basil Pesto: 2 cups basil, Romano or Parmesan-Reggiano cheese (1/2 cup or 2 ounces), pine nuts (1/3 cup), 3 garlic cloves, 1/2 cup extra virgin olive oil. Half and half: It is normally used in coffee or on cereal. Whipping Cream: It is used in sauces and soups and as a garnish for desserts. Heavy Cream: It is used for thickening sauces and making desserts. What is the difference between sour cream and heavy cream? Instant pot steam for 45 minutes. 油蔥要加. 水不可太多, 蘿蔔糊是乾乾的才對. 我用 Samsclub's Farmers Way organic white rice flour (use 1.5. 蘿蔔糊要炒得爛爛的.白蘿蔔本身很軟且多水. Best Ever 2 Ingredient EASY Pancakes Recipe (No dairy or eggs). 1 Egg. Eggs can create a structure of the pancake 定型, necessary when I try the almond flour (Bob's red mill). More eggs would start to move you into custard or quiche-like territory. https://www.chinasichuanfood.com/chinese-steamed-buns/ Several questions are answered there! 250ml warm water, 500g all-purpose flour. The ratio is 1:2 for water:flour. Our 10 Most Popular Soup Recipes of All Time from thekitchn. Broccoli vs. Kale: Which is Healthier? What's the Difference Between Curly, Tuscan, and Russian Red Kale? Celery leave get 500% more calcium, magnesium, vitamin c and phenolic compounds than you would from just eating the stalk. GI: 糯米 > 梗米 > 秈米. 水或高湯 250cc (> 1 cup. We should have more). When I use 2 cups of rice, I need 1.5 to 2 cups of water. 長糯與水的比例是1:0.6.
tips: 用不沾鍋. 油先抹平整個鍋, 飯在鍋中炒完後要翻勻 before putting it in rice cooker/instant pot. Put the avocado oil and use medium high heat in a large skillet. Once it starts sputtering, carefully add the potatoes to the pan. Season with salt and pepper. Leave the potatoes undisturbed for 1 minute before flipping to brown the other side for an additional minute. Squeeze on the juice from half a lemon and toss with fresh Italian parsley. Heat oven to 400 degrees F. Cut potatoes into uniform pieces for even cooking. Place potatoes and garlic on a large baking pan. Sprinkle with salt and pepper. Coat potatoes and garlic with olive oil. Roast vegetables just until garlic starts to soften and potatoes begin to brown -- about 30 minutes. Sprinkle vegetables with rosemary, and continue roasting until garlic has completely softened and potatoes are fork-tender -- 10 to 15 minutes more. Transfer potatoes and garlic to serving platter. Squeeze roasted garlic cloves out of their skins and serve with potatoes. 清蒸保留營養. Eat with avocados, 莎莎醬Salsa or 芝麻醬. 與波菜 or cabbage 吃. 馬鈴薯的酵素會增加葉菜所含的生物鹼. Use your hands to coat the potatoes evenly. 1/2 teaspoon kosher salt. Roast for 15 minutes. Use a thin spatula flip the potatoes. Roast until the potatoes are tender and browned all over, 15 to 20 minutes more. One sweet potatoes have roasted for 12 minutes, remove from oven and toss. Add green beans to opposite side of baking sheet. Toss with a drizzle of oil and a pinch of salt and pepper. Return to oven and roast until veggies are browned and tender, about 12 minutes. I like to cover the green bean part with an aluminum paper to keep their moisture. If we want to roast russet potatoes (1 lb, cut lengthwise into 1/2-inch wedges, no need to peel), we will roast them 20 minutes first (in the bottom position) and after adding green beans (6 oz) over top we continue to roast another 10 minutes. Steel-cut oats: This variety takes the longest to cook, and has a toothsome, chewy texture that retains much of its shape even after cooking. Rolled oats: look like instant oats. Commonly used in granola bars, cookies, muffins, and other baked goods. Instant oats: They are pre-cooked, dried, and then rolled and pressed slightly thinner than rolled oats. Instant oats can be used in place of rolled oats, although the cook time will be much less, and the final dish will not have as much texture. 10 款隔夜更美味的燕麥粥簡單料理 1/3 to 1/2 cup old-fashioned rolled oats & 1/3 to 1/2 cup liquid such as dairy milk, almond, cashew or coconut milk. 鹼性食物, 蛋白質, 纖維, 鈣, 鐵, Gluten(麩)-free. 可溶性纖維: 橙子, 茄子, 秋葵, 百香果,牛油果, chia seeds, lentils, chickpeas. Select Manual at High Pressure and set the timer for 15 minutes. When the time is up, press Cancel, and wait for the pressure to come down on its own. Daily serving: 1 cup. Chickpeas Nutrition, Benefits & Recipes from DrAxe. What's the Difference Between Regular Olive Oil and Extra-Virgin Olive Oil? The bottom line is we can replace one with another. We only need to be careful about the smoke points https://en.wikipedia.org/wiki/Smoke_point. Extra virgin olive oil is 320F or 405F and the regular olive oil is 410F. Breakfast: greek yogurt, egg whites, cottage cheese, smoked salmon, turkey breast and tofu. 7 servings of protein, 2 servings of carbohydrates, 2 servings of fat and 1 sweet. Lunch: Steamed asparagus, green salad, chicken breast and some fruit. 3 servings of protein, 3 servings of low-calorie vagetables, 2 servings of sweeter vegetables and 1 serving of fruit. Dinner: Green beans, mixed salad, Boiled eggs and some blueberries. 0-3 servings of protein, unlimited low-calorie vegetables, 2 servings of sweeter vegetables, and 1 serving of fruit. Milk is a thin liquid with a smooth texture. It should not have an inconsistent color, lumps or be yogurt like. Quarantine the milk immediately if it has a thick cottage cheese like appearance. 零食健康又抗癌: 黑巧克力 (>65%), 開心果, 藍莓乾, 紅棗/乾棗, 蔓越莓乾 Dried Cranberry, 水煮毛豆. 改成小火(否則食物會被煎焦）水倒掉 倒少許耐高溫的油 (avocado. 玄米油) 等到油產生油紋後下食材. Can I use a tagine on a glass cooktop, and do I need a heat diffuser? What's the Difference Between a Gas Grill and a Charcoal Grill? What's the Difference Between Wax Paper and Parchment Paper? What's the Difference Between Roasting and Baking? 1800W Electric Digital Air Fryer. Is it legal to have a device running at 1800W? I thought most home circuits are rated at 15A and could only safely bump out 1875W for a short amount of time. Teflon coating on the basket started coming off. Steel cut oatmeal. 1 cup of oatmeal + 4-5 cups of water. Manual 7 minutes (some websites says 3 minutes). After the oats finish cooking, allow the pressure to release naturally (about 12 minutes). You can add 黑木耳 海帶 紅蘿蔔. Kidney beans. Soak 8 hours or overnight. Cook 30 minutes. Place the trivet in the Instant Pot. Add 1 to 1.5 cup water. Rice. Same amount of water as we usually use. Manual 10 minutes. After done, wait 10 minutes and 'cancel' and unplug. Flour Tortilla: mix 2 cups whole-grain self-rising flour (OR 1 to 1.5 teaspoons of baking powder per 1 cup of regular whole-wheat flour and sift well) with (.5 to .75) cups of warm water (microwave for 30 seconds) and 0.5 teaspoon of salt. Optional add 2 tablespoon of oil. Mix & knead for 2 minutes and divide the dough into 8 balls (we can divide the dough AFTER resting 30 minutes). Cover them and rest for 30 minutes (to make the tortillas roll out and stay thinner). Lightly dust a counter or pastry board w/flour & roll out each ball (add black sesame seeds). Cook the tortillas 30-60 seconds on each side over medium-high heat. Note if there are leftovers, allow them to cool completely, then wrap tightly in plastic and store in the refrigerator. Reheat in an ungreased skillet, or for a few seconds in the microwave. Waffle mix: 3/4 cup whole-grain self-rising flour, 1 tablespoon poppy seeds, 1 egg. Whisking until combined. Season with sea salt and black pepper. Pancakes: 3/4 cup reduced-fat milk, 1 large egg, 1.75 cups whole-grain self-rising flour, 1 ripe banana and some blueberries/raspberries. Muffins: 1.25 lbs sweet potatoes, 1.75 cups whole-grain self-rising flour, 1-2 eggs, 3 tablespoons cottage cheese. Season with sea salt and black pepper. This page was last edited on 14 April 2019, at 11:30.